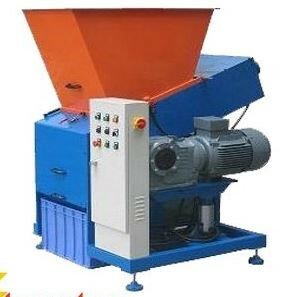 Aerosol Shredder Unit (Series Options: ASU-200, ASU-500, ASU-800, ASU-1000, ASU-1500, ASU-2000 ) is used to drain, crush and contain VOCs from household waste aerosol cans. 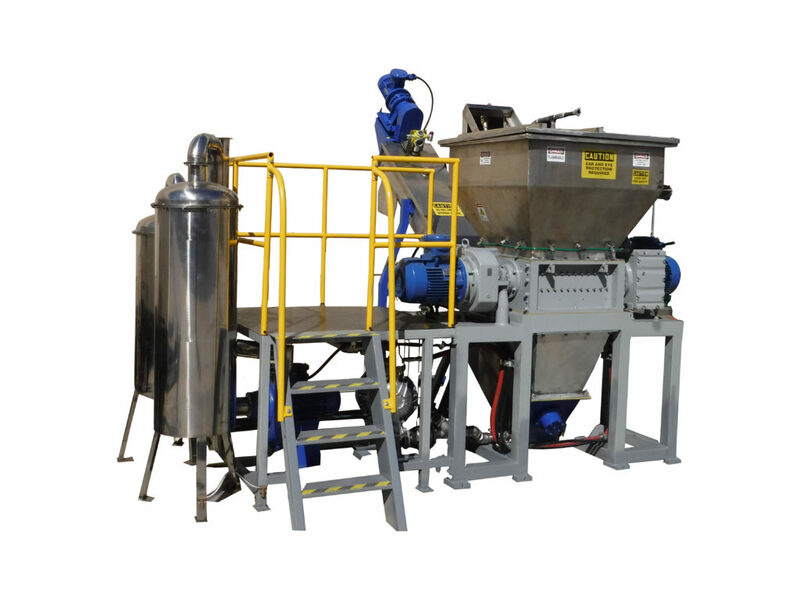 Furthermore, the goal is to reduce hazardous waste seepage into landfills. In addition, we aim to contain the VOCS to prevent OZONE depletion. And finally, to reduce the metal to be further recycled. SRS offers a throughput range from 250 – 6,400 cans per hour. Aerosol cans are loaded into the staging hopper . Operator activates the aerosol can crusher. A Clearing cycle is completed to confirm the chamber is clear. Cans are loaded from the hopper and placed in the crushing chamber. Residual liquid in the can is discharged into a 55 gallon drum. Vapors are pressurized through the drum and into dual carbon beds. Empty crushed cans are discharged into a 55 gallon drum. 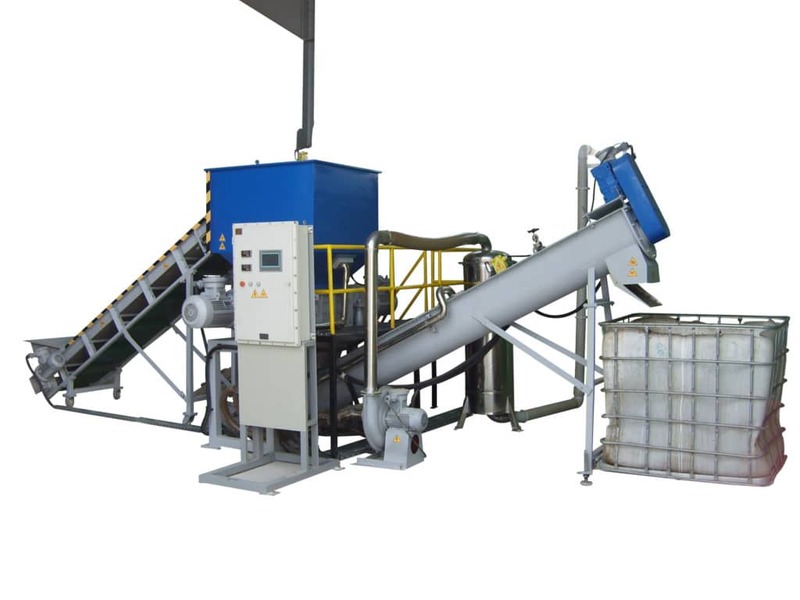 If the system detects that the can has been crushed and discharged, it releases another can for crushing. 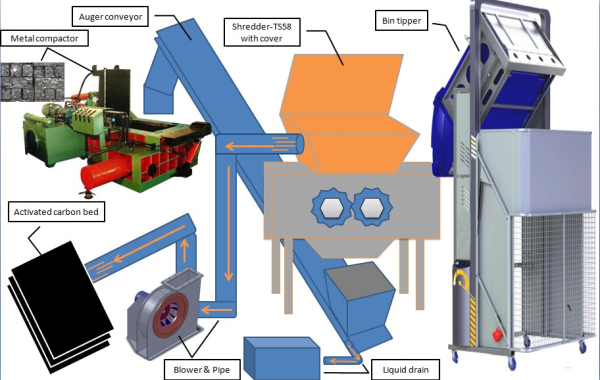 Loading applications can vary based on design request and conveyor processing is also available. Each unit is built to Class 1 Division 1 Standards (explosion resistance package). In addition, the units are designed with non-sparking stainless steel shredding teeth to reduce the chances of sparking. The ASU unit can reduce 4,000 cans in an 8 hours shift. 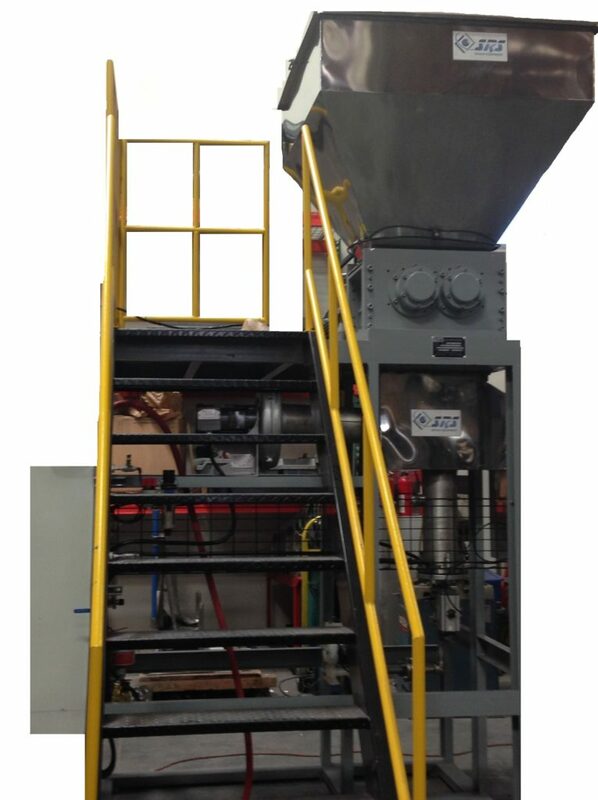 For instance, the Aerosol Shredding Unit (ASU800) shreds up to 800 cans per hour. Equipment is set up with (N2) nitrogen solenoid and flow meter. Vacuum blower removes aerosol vapors to the customer carbon bed or thermal oxidizer. Cylinder positioning sensors detect jams and automatically engage an operation to release the can from the jam to discharge. The PLC controller, completes self-diagnostic check of the overall unit to ensure proper functioning conditions are met. Maintenance screen especially displays all manual activations of the instrumentations.